Though we live in a world filled with smartphones, tablets, and other thingamabobs that respond very well to our finger touches, sometimes you yearn for a tool that gives you a little more creative control over your device. Stylus' (or is it Stylii?) are a part of a bygone era of PDA's, handheld gaming consoles and the first smart phones available, but they're definitely making a comeback lately. There are probably hundreds of unique stylus out there, ranging from simple ones to more complex ones that double as a real pen, or even have interchangeable tips for more precise range of control. But really, it's just an extended version of your finger, able to manipulate a capacitive touch-screen device with ease. We've used a few here at Mashbuttons, and we like some more than others...but today, we're talking about the new Sensu Portable Artist Brush and Stylus. Is it a paintbrush, or is it a stylus? Here is another device that has quasi-dual roles. On the one hand, it's a very nice stylus, fitting comfortably in hand, and serving quite well. But the secondary role, once you take it apart, is it extends to be about the length of a paintbrush, and it actually puts a paintbrush at the tip! It's design truly does mimic a paintbrush that would feel at home in any artists studio. In fact, how can a brush made from real hair work on a capacitive touch screen device? The answer is a copper-infused synthetic brush hairs. That and science! As far as the tool as a standard stylus, it performs admirably. Strokes were registered with great accuracy in Apps we used (Paper, Adobe Ideas, and Kids Doodle). Officially supported Apps are wide, including ArtRage, Sketchbook Pro, Procreate, Auryn Ink, and SketchTime. I didn't use any apps that produce a different image using the brush over the stylus, but I'm also not a painter either. Speaking of painting apps - the SensuBrush was featured in this Windows 8 video where a young girl paints and prints those paintings while showing her dad online...it's neat, check it out. 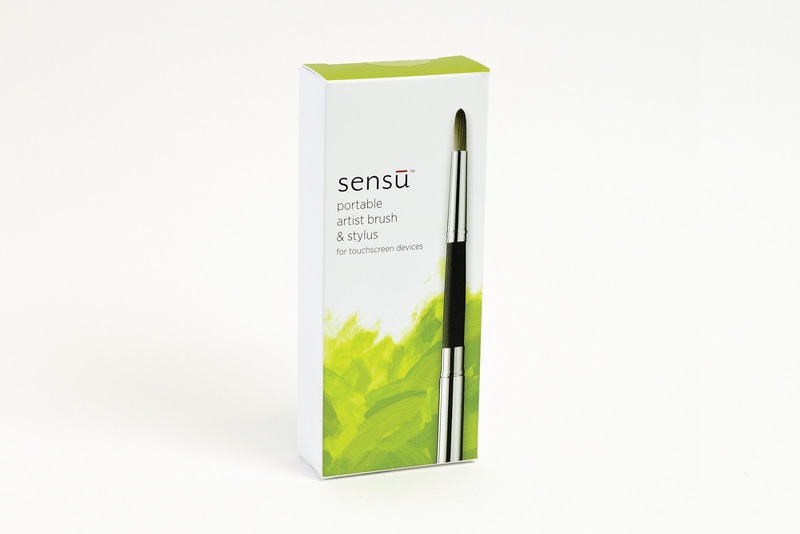 While the video showcases some use of the paint brush, it's a shame Sensu wasn't highlighted as the Stylus maker. I actually like the official videos better, as they showcase a variety of apps (as talked about above) and their use. The brush retails for $39.99 and though it's more expensive than other lesser Stylus, we found it would be worth the asking price. It'd be a great addition to the art lover in your family this holiday season as a stocking stuffer.